The day of your child’s initial activation will be life-changing. Typically scheduled two to four weeks after implantation, this important day may be filled with hope, excitement, and varied expectations. Because children come to the process at different ages, with different hearing experiences and different levels of language development, they have a wide variety of responses to sound. The new sounds may be scary, confusing, or exciting to an infant or toddler. With time and practice, your child’s listening and language skills can significantly improve. Your child’s journey to hearing will undoubtedly be full of cherished moments. The initial activation will be scheduled two to four weeks after the implant surgery. It may feel like an eternity between the two dates, but this gives your child time to heal as your family prepares for a new beginning. Each child is unique and will respond differently to what they hear. The sole objective of the initial activation is to find a comfortable volume for your child so that their first hearing program or “map” can be set. With time and practice, your child will hear increasingly more details in the sound around them. Some clinics provide materials and kits in advance of activation. If your audiologist provides you with reading materials and DVDs for your child’s sound processor, be sure to review them before your child’s initial activation. Knowing how to properly operate your child’s processor will provide the confidence and know-how to help your child hear their best every day. The audiologist will use special software to create a customised set of programs for your child’s sound processor. It’s during this process that your child should begin to be able to hear sound. Some children will be able to tell the audiologist what they hear as well as the volume and pitch of sound. If your child is unable to communicate what they hear, do not worry! Your audiologist is specially trained to observe your child’s behavioural responses to sound. Additionally, AB’s software provides your audiologist with a tool to measure the hearing nerve’s responses to sound so that the appropriate levels can be set for the hearing program regardless of your child’s ability to participate in the programming. What Could it Sound Like? At first, very young children may not have association or comprehension of sound, so they may not know right away that they are hearing. They may be alarmed by what they hear or they may even ignore it. No matter the response, the fact that they can hear is cause for celebration. Young children who have not yet developed auditory skills and oral language have some catching up to do. Language is not created overnight, nor is awareness and comprehension of sound. A two-year-old child who has been deaf since birth has to catch up on associating sound with words and words with meaning. The speed of progress varies from one cochlear implant recipient to the next. In addition to devising a rehabilitation plan with your child’s audiologist, you can also utilise The Listening RoomTM, an interactive website for parents and professionals that provides free ideas, materials and support in English to promote active listening and language stimulation. How Well Will My Child Hear? As your child adjusts to their new cochlear implant, they will perceive sound differently over the first days, weeks, and months. This is a natural occurrence that coincides with changes in the auditory system as your child’s nerves and brain acquaint or reacquaint with sound. It takes time and practice to hear your best with cochlear implants. It’s important to remember that it is a process, not an instant fix. Just as those with normal hearing had to learn to hear, your child will need to practice to learn to hear. You can work with your audiologist for a rehabilitation plan and utilise AB’s resources provided in English in The Listening RoomTM. Bring your child’s favourite toys to the the activation appointment. Fitting the processors and conducting initial programming can take 30 minutes to an hour. Having fun distractions like toys will not only help your child pass the time, but also keep them occupied while the audiologist manages the equipment and programming. During the appointment, it’s also important for you to share with the audiologist your observations of your child’s responses as your input may be very helpful in the programming session. Although you can bring people to your child’s first programming appointment, you should consider having only your closest immediate family member or friend attending. Your audiologist may also have some input on who they recommend you bring, if anyone. Sometimes people want extended family, such as grandparents, siblings, or others to share in the wonder of their child’s very first hearing moments. However, a child can be overwhelmed or frightened during the process of programming. At the first appointment, having too many people around can potentially distract a young child. The audiologist will connect the programming system to your child’s processor and place the headpiece over your child’s implant. The visit may begin with running diagnostics and testing the software to be sure everything is active, including your child’s auditory nerve. 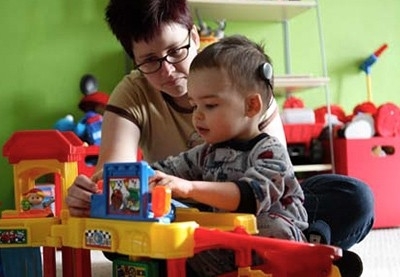 Neural Response Imaging (NRI) is a method used to gain information about a child’s auditory nerve and the levels at which a response to sound input can be achieved. Your child may or may not react to sounds during this test and can move around and play with toys while the test is being conducted. Your child’s processors can each store three hearing programs. At your child’s first appointment, the audiologist may start with one program or may provide a few programs to try before the next appointment. Your audiologist will tell you what each program is for, when to use each one, and how to compare them. You should observe your child and take note of any differences you notice in responses with the processors on, when using different programs, and the types of sounds that occur. Don’t expect to see a lot in the initial days and weeks as it will take time for your child to adapt. Ask your child’s audiologist and auditory or speech/language therapist for help in becoming a good observer of your child’s responses to sound. The audiologist will slowly increase the volume and will evaluate your child’s response. The first sounds can produce a variety of reactions, including crying, laughing, looking up, bewilderment, or even ignoring it. Because sound has no meaning to a child yet, they may not have any obvious reaction at first. Should this occur, audiologists apply their specialised training and identify behaviour that might otherwise go unnoticed. These important steps will help ensure your child is hearing their best during this phase of their journey to hearing. If your child is old enough, they may be asked to compare the volume of two sounds so that your audiologist can set the volume for different pitches. This may be repeated for multiple sounds. Your audiologist will help your child remember that volume refers to the loudness of sounds, while pitch refers to the tonal quality. For example, a sound that is lower in pitch sounds deeper, like a bass drum or a man’s voice. A sound that is higher in pitch sounds like a whistle or a woman’s voice. Your child will want the volume levels the same, even when the pitch is different. It may sound complicated, but this activity often gets easier with time. Before you leave your child’s audiologist’s office, be sure you understand how to put on and control the cochlear implant system’s processor and batteries. The Quick Start Guide and User Guide may be used to review after you’ve had some experience with your system. Remember, sound may or may not be pleasant for your child as they start out with their cochlear implant. Regardless, it is important to keep the sound processor on during most waking hours because every moment matters in your child’s listening and language development. Your child’s audiologist will guide you in scheduling the next mapping sessions. Typically, multiple mapping sessions are needed through the first few months of your child’s journey. Your observations of your child’s responses will help the audiologist make adjustments, evaluate your child’s progress, and optimise your child’s hearing.